Jan Jaap Minnema at Fraser Yachts in Monaco drops me a line to say that his central listing, Moonen's 34.7m motor yacht My Issue II, has had a major price reduction. 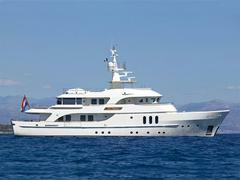 He goes on to say that the luxury yacht's just completed surveys and renewed her Lloyds certification and now, complying to the latest safety standards, is ready for her new owner. Built in 2006 and fully MCA compliant, My Issue II has an ice-classed hull and is the only currently available Dutch built full displacement superyacht of its size. The boat sleeps up to 12 guests in a master, two doubles and two twins plus two Pullman berths and has seen her price come down from €14.95 million to €12.5 million.